One of the things I love about working in the wedding industry is seeing all of the options that are out there for couples to make the day their own. Unfortunately, I planned my wedding before I started working here! I’m always seeing things that I wish I knew about before my wedding. My husband Tom and I were the first of our friends to get married, so we didn’t even have much experience being guests at a wedding. Since I’ve started my career at JPG I’ve fallen in love with the “First Look” option for the bride and groom on their wedding day. Before our wedding Tom decided that he wanted that moment of me walking down the aisle with my dad to be the first time he saw me in my dress. Seeing as most of the wedding decisions he was fine with whatever I decided, I wanted to give him the small things that he did request. When Tom and I had our phone call with Joe the week of the wedding to go over the timeline for the day, Joe brought up the possibility of a first look because he knew we didn’t want to miss cocktail hour. But again, Tom said no. So we stuck to the tradition of not seeing each other before the wedding. Man! If only I knew then what I know now! One of my favorite parts of the wedding day has become the first look. 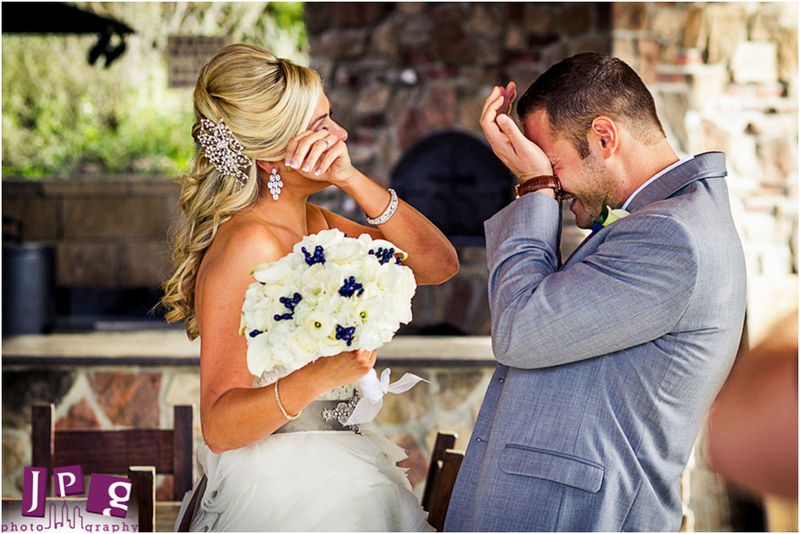 There is so much emotion between the couple in that moment! Our photographers do a great job of hanging back and making sure the first look is a private time for the bride and groom to share alone. Now when I meet with clients I tell them there are a few reasons that a first look might be a good choice for them. I don’t know about you, but I love appetizers. I’ve been meaning to have a party called “There’s an app for that” and having everyone bring an appetizer to share. When you don’t have a first look there’s a good chance you’ll miss out on most of the cocktail hour because you’ll be busy taking portraits with family and with each other. Couples who choose to have a first look can take care of a lot of the portraits, especially the ones of just the bride and groom, before the ceremony leaving more time for apps during cocktail hour! I’m guilty of crying at anything remotely emotional, including a very touching peanut butter commercial I saw once. I imagined that I wouldn’t be able to hold it together during my ceremony. I didn’t, however, worry that Tom would have any problem keeping his cool. Boy, was I wrong! 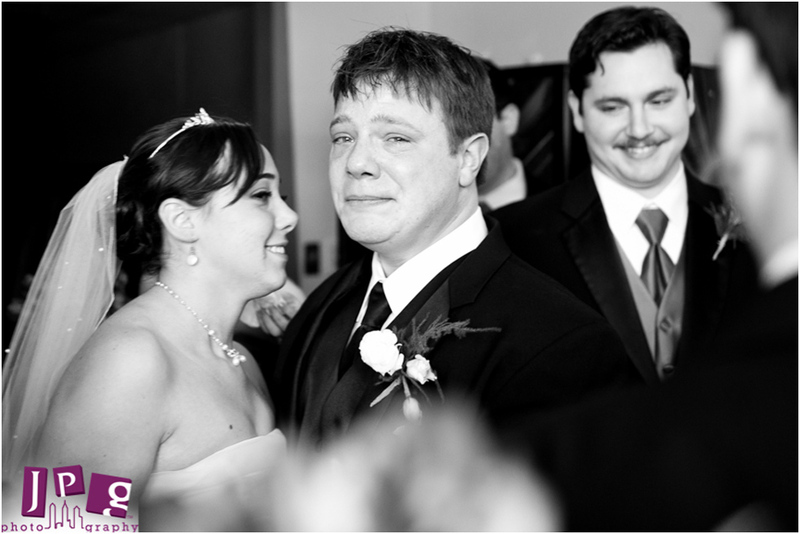 I joke and tell people that I look like I just got married in the pictures from immediately after the ceremony, and Tom looks like he walked out of a funeral. The moment I stepped into Tom’s view he broke down. We blubbered through our vows that no one else could hear and Tom sobbed openly in front of 200 of our closest friends and family. 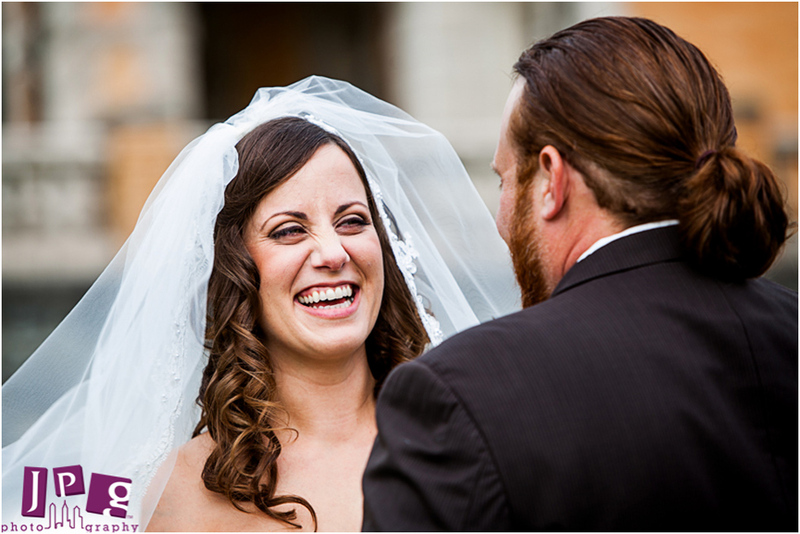 When you have a first look it gives you the chance to get some of those emotions out before you step into the ceremony in front of all your guests. Tom and I spent plenty of time together on our wedding day, but we were never alone. There were relatives and friends who had traveled from near and far to help us celebrate and we spent most of the night visiting with our guests (and dancing up a storm). The first look is a great time for the bride and groom to have some time without anyone else to soak in the fact that they’re getting married! It’s a time to just enjoy being together and prepare for all the excitement of the day. If I had seen all the emotional and touching images of first looks before I got married, I may have been able to convince Tom to forego tradition. Having said that, I get the desire to have that special moment of gazing down the aisle at each other. But I want to make sure that all the couples out there know the options that are out there for their wedding day. Happy planning!